Does any of you had tried Tumult Hype on your projects? If so, is there a tutorial I can follow? Tumult Hype is excellent. LOADS of tutorials out there. Google is your friend. Thanks pauland. Do you use it with Blocs? What does a typical Hype export require to work when it’s nested in a web page? I’d be interested to know as I may be able to improve support for Hype exports when used in Blocs. I haven’t used Hype with Blocs. You could use Hype for building a website, but I have used Hype for building a webapp and animated/interactive diagrams and also for HTML content for use with the YUDU publishing system. Essentially, it’s really easy to include Hype animations in a web page because the animations are within a Div and all of the referenced assets sit in a single directory (I guess it may call out else where - I haven’t really looked too closely). So, to add Hype content to Blocsapp, you’d be placing a Hype div into the generated Blocs HTML and needing to add a directory to the export. Thanks so much. I have to study all you are talking about so I am new in this stuff. I will look your instructions and I am glad you share you share it. Hi Norm I do not know enough about Hype to answer to you but I suggest that you look the last version of Hype http://tumult.com/hype/pro/ so it is very interesting. I drop Muse and dropping Squarespace to start to use Blocs for my future projects. Could be a very good ideia to improve the support you’ve mention. A good integration Blocs-Hype should be awesome. Hi @Norm, is there any support of Hype coming to Blocs? Or @Francisco did you managed to get it working already? I tried many options, even editing the *.js export files, but don’t get the html export from Hype working at Blocs. Only the PNG/GIF options are working, but the quality isn’t that great. I’ve never tried, I used it a few years ago but never did get around to improving implementation. 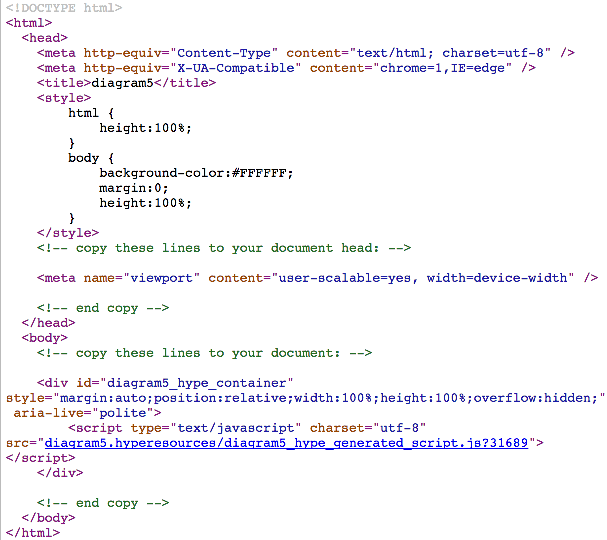 Wouldn’t it just require embedding the HTML snippet and attaching the JS resources? If it was that easy, I should have managed that. It looks pretty simple. Just add some code to the header (done), add some html to the canvas (done, made a new bloc with html code). But then comes the .js code. In the export it isn’t saved at a js folder, see the code of @pauland above. In those .js files are some connections to other .js files in that same folder. Even added such folder to my ftp upload, but it still gives a blank screen instead of a animation. I can’t see why it doesn’t work, because I don’t see any error code of something like that. @norm hype (another GO TO app for years) is worth having a look and it is quite affordable. I am a beta user and the 4th version will be released soon. it would be great to have a better communication / integration in BLOCS with HYPE. in adobe EDGE (R.I.P.) and adobe MUSE (R.I.P.) you just needed to drop the hype-exported OAM-element into the canvas. with some basic preferences inside MUSE you could even trigger some behaviours in muse while the OAM-element was shown in the browser. Totally agree, I should hopefully have time soon to explore Hype again and see whats required. Norm you and Jonathan founder and developer behind Hype Professional should team up try to integrate some features from one to another. Besides, the business model from my point of view is similar for both apps. I’ve integrated Hype very easily in Blocsapp. Essentially, it’s just a question of adding one line of header code and two lines of code into an HTML bric. The really nice thing is that you can make various layouts for different devices - just like Blocs itself. The only things that should be remembered when using Hype for an application such as this is to have your site and it’s page names fairly much pre-planned - you need the page names for links etc. The other issue is that any graphics imported into the Hype project should be in SVG format for maximum sharpness. All text objects should also be created within Hype so as to keep them as text. Importing text images can cause quality loss. The only thing that Blocs should really do to aid even simpler integration is to add the ability to import an external resource folder so that Blocs itself can display a preview of the animation.